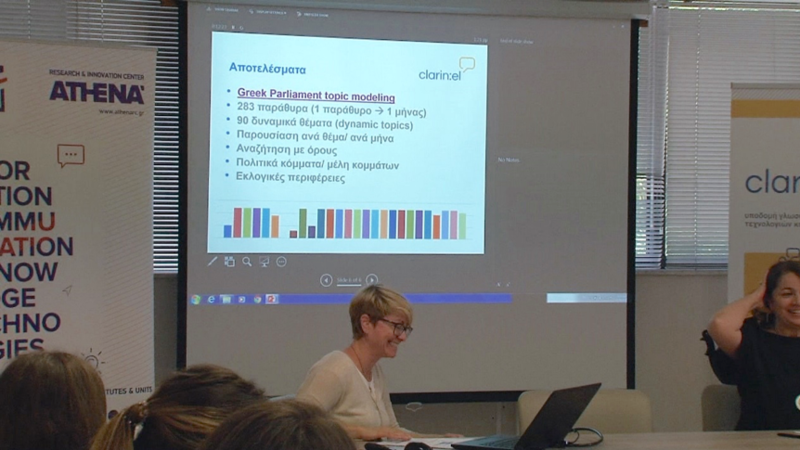 Tour de CLARIN presents: the clarin:el event, "Language data and technologies in social and political sciences"
On Wednesday 27 June 2018, the Greek Infrastructure for language resources, technologies and services clarin:el organized an event on Language Data and Technologies in Social and Political Sciences, which took place at the Institute for Language and Speech Processing (ILSP/"Athena" R.C.). ILSP, which serves as the coordinator of clarin:el, invited prominent Social and Political Scientists from the National Center for Social Research (EKKE) and the Department of Political Science and History of the Panteion University (which are the two new member institutions of the Greek CLARIN network) for a focus-group workshop. Aiming at the mutual acquaintance of the two scientific areas (Social and Political Sciences on the one hand, and Language Technology on the other), the 15 researchers of EKKE and Panteion University were given the opportunity to present their research questions, the way they work, the current methodologies they follow, and the tools and the data processing techniques they are familiar with. This took place in a lively interactive session, which has been recorded on video. In turn, ILSP researchers presented specific language technology applications developed in the framework of multidisciplinary research projects, and showed how they can be used to tackle qualitative research questions. These presentations reinforced the interconnection between the two scientific areas, highlighting the key role of Language Technology in facilitating research in the domain of Social and Political Sciences. 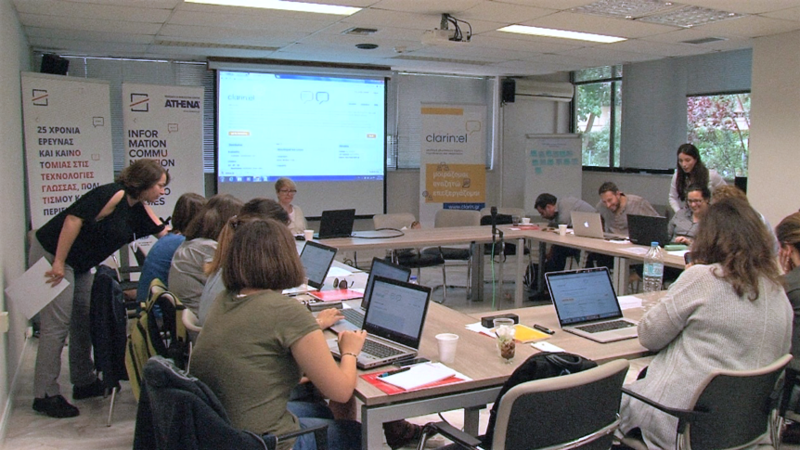 The second half of the event familiarized the Social and Political scientists with the clarin:el infrastructure. 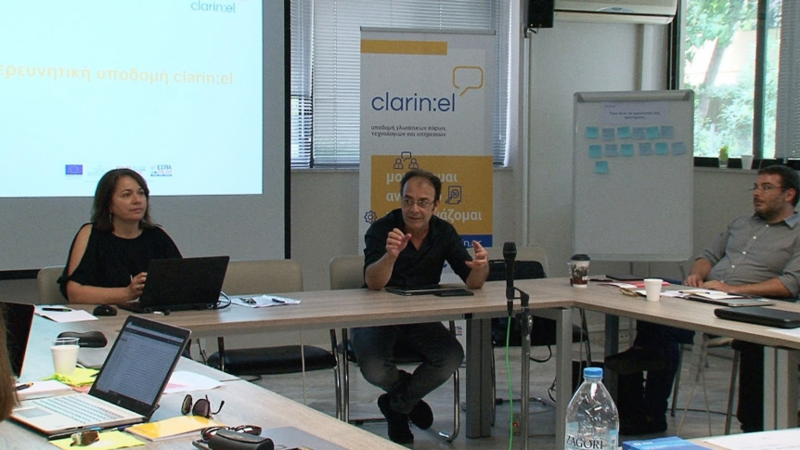 A detailed presentation of clarin:el (which focused on the portal, the repositories, the inventory of resources, and the tools and web services) served both as an introduction for the two new member institutions and as a glimpse of their tasks as nodes of the network. Additionally, the researchers were shown how to set up their repositories, prepare relevant documentation and upload their resources. The presentation was followed by a hands-on training session, where the researchers were given a "guided tour" of all the features of the infrastructure and, through guided exercises, were able to familiarize themselves with the clarin:el inventory and the use of its resources and tools. 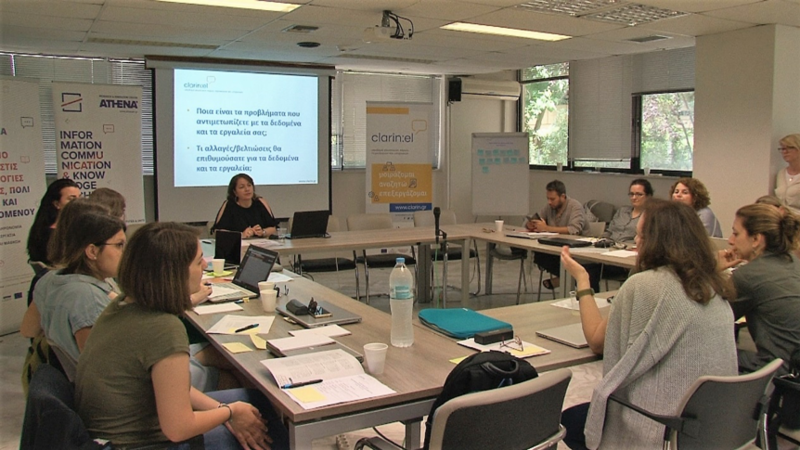 The most crucial factor for the uptake of the clarin:el infrastructure (as expressed by the participants) was access to tools and web services and secondarily access to other resources. Lower in their motivation for using the clarin:el infrastructure was the incentive to share their own resources, or to store resources in the repository. The role of language resources' infrastructures as regards the hot topic of legal issues (clearance of IPR, copyright issues, distribution issues, standardization of licensing procedures etc.,) was considered very significant as regards the protection of language resources' contributors and consumers from illegal use. Finally, the promotion of a "sharing culture" and of open language data and tools was also highlighted as a crucial activity of language resources infrastructures. Blog post written by Maria Gavrilidou. Click here to read more about Tour de CLARIN.